There are few things that are so amazing as the play of light on the water at sunset. So many colors appear in the water, yet if you put the water in a glass, the colors are not there....an illusion? a trick? Or is Mother Nature showing us that elusive beauty in life that we can experience but never capture and own for ourselves? Hopefully, we remember all those beautiful moments and scenes where we stop and notice something incredible around us. 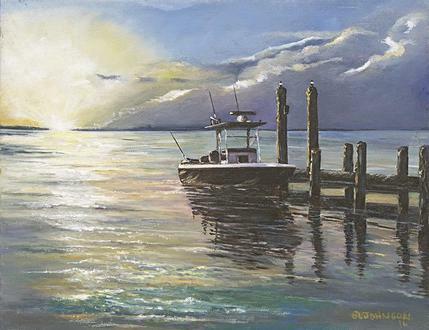 Put yourself in this painting and marvel at the surroundings as you leave the dock and glance back.